The gameplay is pretty simple, you can move up and down or left and right and fire your gun at the numerous enemies that fly, run and crawl down the screen toward you. 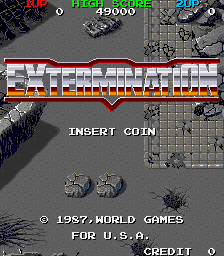 What made Extermination a bit different was you needed to kill the monsters in order to replenish your life. As you were hit your life score would continue to drop, but as you killed the monsters tiny orbs would slowly drop down toward you. When you collected the orbs you would regain health, this helped to make sure that you killed as many monsters as you could.